The historic chalets collapsed earlier this week. 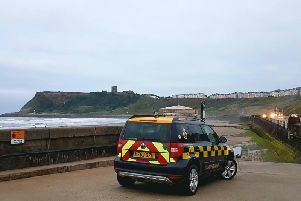 Scarborough Council is to demolish a number of listed beach chalets in the resort’s South Bay following a further landslip this week. The chalets, which sit below the Clock Cafe, had been cordoned off following the collapse of retaining wall in March this year which left them leaning at a 45 degree angle. The council was seeking listed building consent to demolish them which was due to be granted next year. However, on Tuesday the chalets collapsed further and now the council’s chief executive, Jim Dillon, has taken the decision to step in. A printed decision, issued following the chief executive’s “urgent” intervention today, states: “The chalets are listed buildings, and whilst intact, would require listed building consent to be demolished. That permission was not expected to be received until May 2019. “However, on 27 November 2018 the chalets collapsed of their own volition due to continued pressure from the failed retaining wall behind. “The area has been visited by the council’s consultant who advised that, whilst not at immediate risk, there is a steep section of ground above the path and with further wet weather this path could potentially be at risk of collapse/slip failure. The decision also noted that conservation officials have said that given “the potential risk to the surrounding pavements and further failure of the slope” the demolition of the chalets can be accepted before listed building consent is obtained. Photographs will be taken during the demolition to be provided to Historic England as proof of the urgency. The council will use £50,000 from its Capital Development Reserve to fund the initial cost of the works.